If you're looking for peace and quiet look no further. This property has all the amenities you're looking for and the seclusion you need. 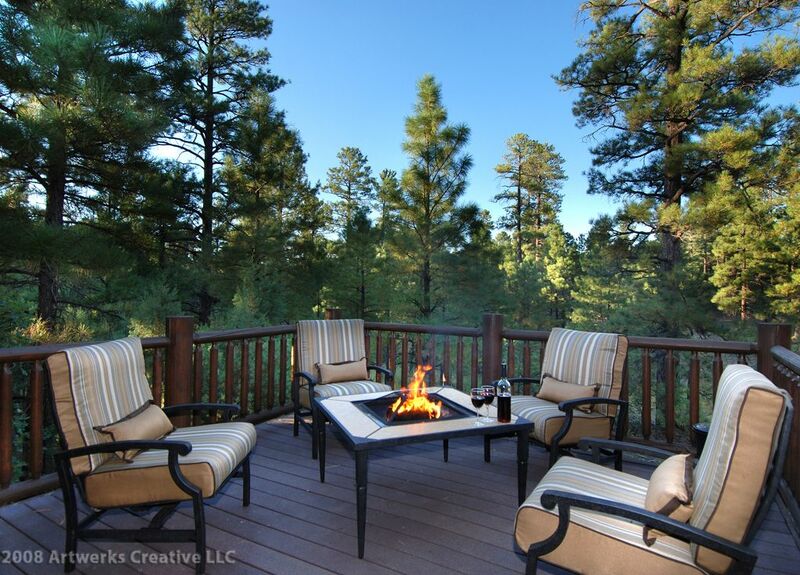 Relax in the tall pines and enjoy outdoor living at its best or take advantage of the Torreon amenities. There is a playground for the kids, walking trails all along the golf course. Please note golf is not included in this rental. The Family Center is a unique feature of Torreon that includes a 2 hole golf course just for the kids and those still learning, a private fishing pond, basketball and volleyball courts; and a supervised game room with pool, ping pong, air hockey, video games and a large screen TV (open from Memorial weekend-Labor Day weekend, and some holidays; make sure to select the optional Torreon fee for access to these amenities)*. Relax in the beautiful swimming pool and spa, and enjoy working out in the newly expanded fitness center. There is also an Equestrian Center for horse enthusiasts. Fine dining and casual dining restaurants are available on property. Don't forget the winter sports! Show Low is about 45 minutes away from Sunrise Ski Resort. *Pre-approval for pets is required. Only 2 small non-shedding dogs allowed. Please see our pet addendum in our rental agreement for other requirements and restrictions. My Husband and I live in Phoenix and love getting away to the white mountains. We enjoy skiing in the winter and the beautiful weather in the summer. We have cabins listed on VRBO available in Pinetop Country Club and Torreon. The White Mountains is an ideal getaway spot because of all the lakes, mountains and outdoor activities. It has the ideal weather in the summer as is almost 20 degrees cooler than Phoenix. Winter offers skiing and great snow. Our family truly enjoys getting up there on weekends since it is only 3 hours from the Phoenix metro. We decided to furnish our two cabins with brand new furniture, high quality linens and fully stocked kitchen. Our goal was to buy the same quality type items we would find in our own home and make the experience as enjoyable as possible for our guests. Peaceful, quiet location, as advertized. Good layout inside. Master duvet needs cleaning (was stained). Overall we were pleased with our stay. The house was clean and the snow was abundant! We enjoyed our stay! Quiet, super comfortable and great views! Fabulous cabin nestled in a quiet community with outstanding wilderness views. All the comforts you could ask for. Great bedding, soft towels and throw blankets for the living room. Kitchen was well stocked with dishes. Easy checkin and checkout processes. We can’t say enough good things about this cabin and we will certainly be visiting again! We spent Thanksgiving at the cabin. Clean and cozy and had all the amenities we needed. We enjoyed the Torreón grounds and amenities as well. Sara was very responsive with the couple questions that came up during our stay. Highly recommend and our family will be back! Thank you for the review! Hope you stay with us again. Beautiful, quiet, and clean cozy cabin!! This was my families first time renting a house for a vacation. The cabin was amazing and cozy. We loved cooking breakfast and dinner a couple of the days we stayed. Enjoying our morning coffee while swinging on the back porch swing was so relaxing. The kids got to explore in the back forrest area behind the cabin. We rode the bikes that were provided in the garage all around the Country Club and the kids rode their scooters we brought from home. Missing the roasted s’mores we did every evening. Great fall break getaway!! Please see our cancellation policy. We do not refund amounts within 90 days of reservation. Please purchase travel insurance if you are concerned about having to cancel.